There’s a circulating myth that Black Friday isn’t the shopping holiday it used to be. But with the $5.03 billion in online revenue last year, it’s still a firm fixture in consumers’ shopping calendar. Undeniably, Black Friday is a notable event both for online shoppers and eCommerce store owners alike. We anticipate that this year’s Black Friday shopping sales will continue to soar. And today, we’ll help you achieve your most successful Black Friday campaigns yet. If you’re tired of the same old Black Friday campaigns, this article outlines some of our favorite and most successful Black Friday campaigns from previous years to revive and amp up your game. This will serve as an inspiration and will get you all ready to impress the Black Friday shoppers and gain more sales. We’ve broken down what these Black Friday campaigns are all about, why they have become so effective, and how you can steal them away and implement them into your very own Black Friday campaigns. Ready to stand out? Let’s begin! Before we proceed with our examples of the most successful Black Friday campaigns, let’s get the basics right first. These basics will be your foundation for a foolproof Black Friday campaign, ensuring that you’ve got everything covered during this busy holiday season. 85.8% of last year’s Black Friday shoppers received free shipping on their purchase, making it not only a key driver in purchasing decision but also a standard in consumers’ expectations. Shoppers tend to increase their purchases to avail free goods like shipping. Equally, nearly 3 in 4 shoppers would buy more if they could receive their orders the day the purchase was made or would rather spend an average of £5.52 for a next day delivery. More than 6 in 10 shoppers said price as the key factor for buying during the Black Friday season. Consumers use price comparison platforms to find the best bargain. This must remind business owners to come up with competitive pricing strategies with the best returns. Store owners must take caution on pricing variations across platforms to guarantee that they’re of equal footing with the broader market. Almost 9 in 10 shoppers intentionally purchased during Black Friday to take advantage of promotions and receive a discount. And while you might be tempted to overly promote your Black Friday promotions, this might bombard your shoppers and distract them from purchasing. They already expect that you’ll offer promos and discounts, the best approach is to promote them on your site’s most prominent area — the header. Your website’s header is mostly what shoppers first see. 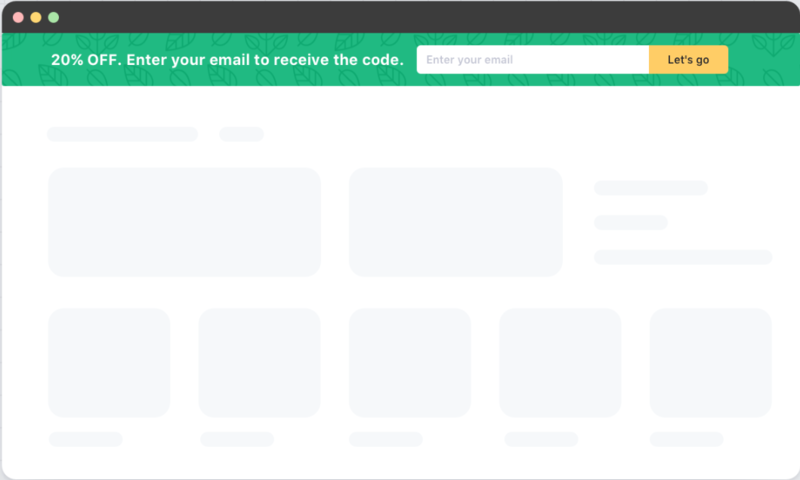 Using header bars is an effective way to take advantage of your site’s most visible area. Header bars afloat or stick at the top your page to relay important messages. What you can do is to use them to display your Black Friday promotions. This way they won’t interfere with your site’s main content and distract your shoppers. The free Smart Bar feature from SiteKit will help you design highly attractive header bars to drive your shoppers and smartly convert them with your Black Friday promotions without disrupting your customers’ shopping experience. 32.9% of shoppers have done their Black Friday orders using a mobile phone. With the innovation in mobile shopping for the past years, it makes sense that more shoppers will use their mobile device to research and make their actual Black Friday purchases. Invest in a single responsive website to deliver a seamless shopping experience that works across devices – prompting efficiencies in cost and maintenance, plus a boost in your search engine optimization (SEO) efforts. Now is the best time to get your past years’ Black Friday data and highlight behavioral patterns from your Black Friday shoppers. This will help you plan your Black Friday campaigns more effectively. You can do segmentation strategies to display the relevant Black Friday promotions to the right shoppers at the right time. Your historical data can also help you uncover the peak times where most of your shoppers are on-site so that you can schedule the timing of our deals and sales. You obviously need to promote and announce your Black Friday campaigns on social media to build anticipation and buzz around them. While omnipresence is ideal, you won’t have to be everywhere on social media. Not only that it is time-consuming but also needs a lot of efforts. Focus on 2-3 social channels based on where most of your traffic came from, where most of your revenue piped in, and where you generated the most engagements. Shoppers expect to get the best bargains during Black Friday and so offering discounts is inevitable during this period. However, you can’t go into Black Friday and just place 10% off or 20% off on any items and then assume that they will sell out immediately. At the end of the day, it’s not just about how much you can lower your price but more on how you can make sure your deals and discounts are compelling enough for customers to purchase them as quickly as possible. This is where urgency and scarcity tactics will help you get that desired action. You can apply time-related drivers to intensify urgency and quantity-related triggers to heighten scarcity. 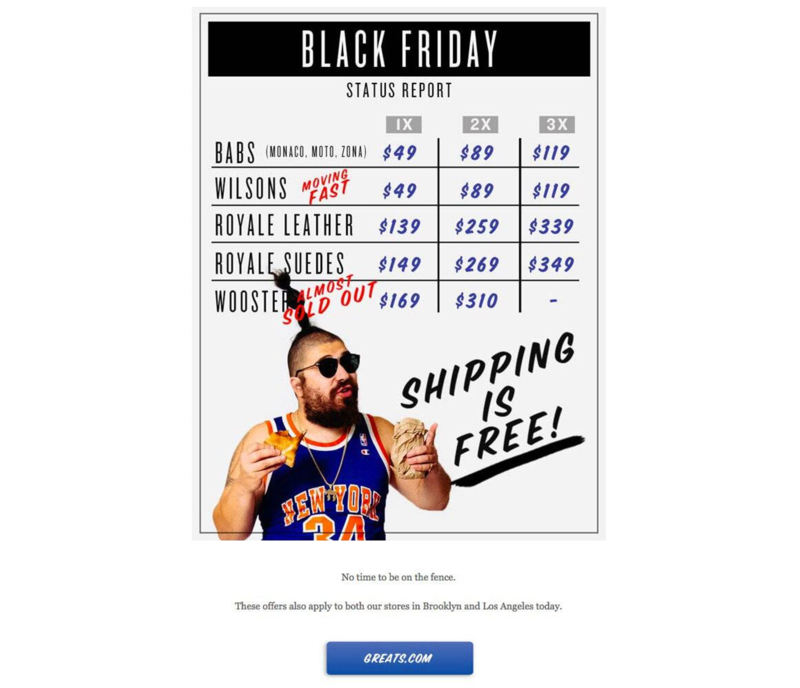 For example, Greats sends a Black Friday status report email to its customers to notify them regarding the stock availability of their shoes on sale. This Black Friday campaign was successful because it used scarcity messages like “Moving fast” and “Almost sold out” to drive shoppers to act quickly if they don’t want to miss out the deals. It also used urgency triggers like “No time to be on the fence” and free shipping as incentives. Black Friday is a crazy shopping season both for customers and store owners. As much as possible, you want to break free from all that craziness. Humor is an essential ingredient to do that, especially with the intense competition you want to show some personality in order to be more relatable, break down the barrier, and connect with your audience. Have fun with your Black Friday marketing campaigns. Don’t be afraid to poke fun at yourself. Customers tend to react more positively when you reveal that you can let your hair down sometimes. It allows you to cut through the noise and makes your brand more human — someone who your shoppers can trust. 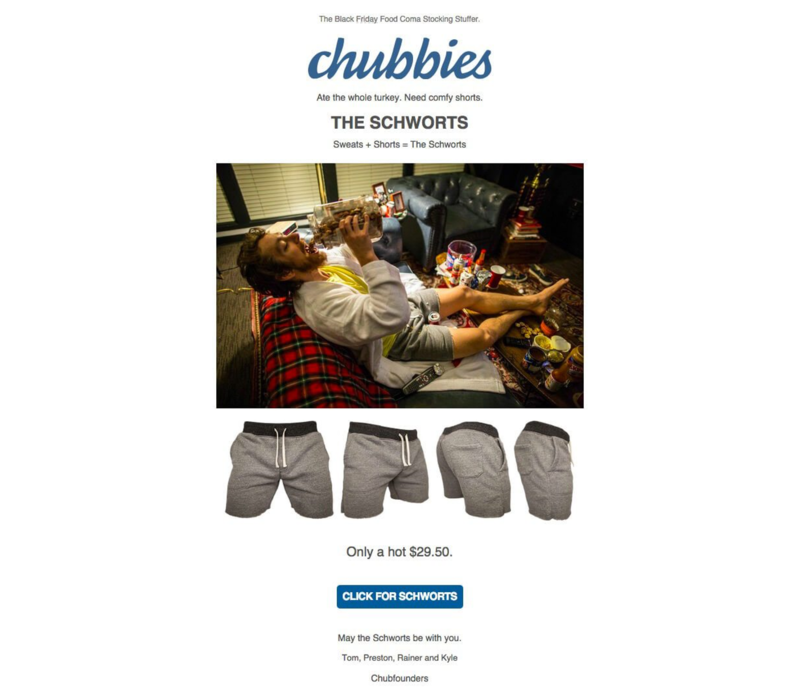 One of the most successful Black Friday campaigns that used humor is from Chubbies. They promoted their “schworts” on Black Friday with a humorous concept of a man idling on his sofa pouring food down after Thanksgiving. It also included funny copy like “Ate the whole turkey, need comfy shorts” which is basically promoting the comfort of their product “schworts”. While Black Friday has risen to a popular shopping period over the past few years, it also has a negative connotation because of the overcrowded shoppers and the bombarding of different deals here and there. It’s just natural for some people, even online store owners, to become sick of all the Black Friday ads and special deals. This has given reputation to some brands creating their anti-Black Friday campaigns to boycott the event but still cleverly taking advantage of its popularity. And the result, it garnered positive praises from their customers and even exposed their brands to new audiences. It only shows that you don’t have to join in the bandwagon if it goes away with your brand goals. You can also consider producing your Black Friday campaigns in a different route. It could be an opportunity for you to give back to a cause close to your heart or in relation to your brand. A Black Friday for a cause fosters a positive brand image for your eCommerce store. Patagonia, a renowned American outdoor clothing company, produced one of the most successful Black Friday campaigns with a cause by reaffirming their powerful stance on environmental conservation. Their initiative last 2016 Black Friday was to donate its entire global sales to 80 grassroots environmental organizations around the world. At the end of the Black Friday sale, they were able to come up with $10 million worth of donation to help save the environment. With the prevalence of live video features from social platforms over the past years like Facebook Live and Instagram Stories, expect that more and more brands will start using them for real-time engagement. And Black Friday campaigns won’t be spared. Recent studies revealed that people are spending 3x more time in live videos than those which are not broadcasted live. This is one of the reasons why Amazon jumped in the live broadcast of its Black Friday sale on Facebook last year. Amazon’s Live Black Friday Deals generated overwhelming 132k views and 1.2k reactions from shoppers all over the world. This allowed them to build a new channel to reach out to their Black Friday shoppers real-time. Black Friday isn’t always just about discounts. Some luxury brands, for instance, seem to think that discounting their items doesn’t align with their brand ideals and so they won’t just participate with Black Friday. However, there’s always an alternative to partake and take advantage of Black Friday’s popularity without having to sacrifice your brand values. Instead of offering discounts, why not offer something different? Something that would stand out from the rest of the competition. A perfect example is Barnes & Noble’s most successful Black Campaigns yet. 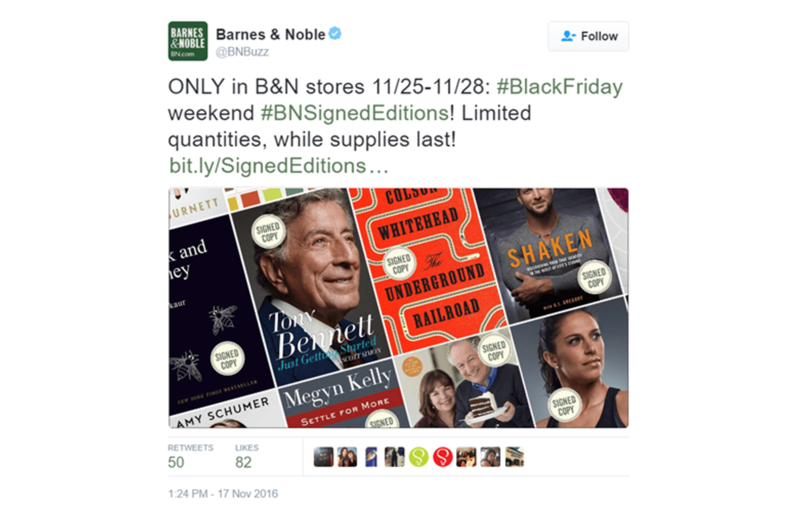 What they did was launched over a half-million autographed books from acclaimed authors as their Black Friday deals. Now, who said Black Friday can just be for discounts? With 47.2% of Black Friday deals are still purchased outside of the Black Friday period, this urges online store owners to go beyond Black Friday when planning their campaigns. One trait to the most successful Black Friday campaigns is it goes after the supposedly lost Black Friday sales. For instance, Blenders Eyewear did not just focus on Black Friday itself. It went after all the abandoned carts during the Black Friday period. 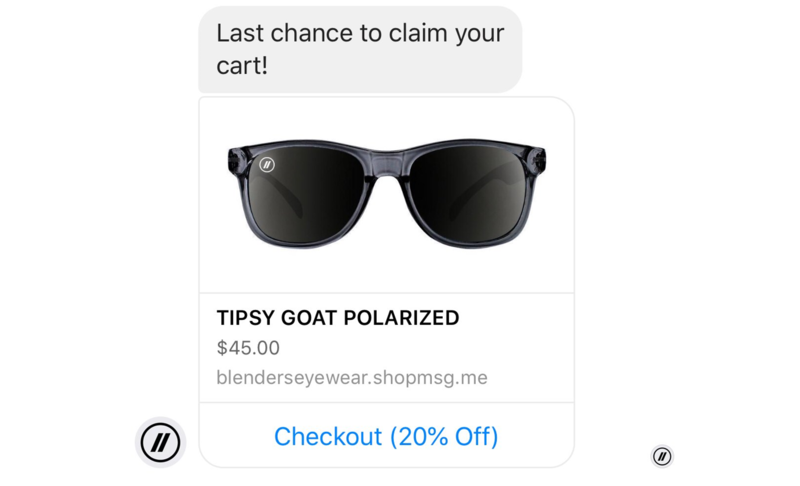 What they did was to set up a cart abandonment campaign on Facebook Messenger targeting all abandoning Black Friday shoppers. The result was a massive $30,000 revenue from otherwise lost sales on Black Friday. Hailed by bargain hunters as the most popular shopping day of the year, it’s no secret that Black Friday is one of the busiest and craziest holidays for eCommerce owners — deals and discounts everywhere! While shoppers are ready to spend billions of dollars during Black Friday, online store owners are fighting to get the shoppers attention and cut through the competition. A lot of you will try to go with the norm by offering the usual Black Friday deals and discounts. But, if you want to freshen up your Black Friday campaigns and absolutely crush it this year, then get inspired with and steal away from our list of the most successful Black Friday campaigns to help you navigate the craziest shopping period of the year.